Blonde and beautiful Lady Anna Blacknall is in the mood for mischief. Entering Dublin’s most notorious den of vice, she finds herself in the arms of a mysterious, emerald-eyed Irishman. And although he is masked, his tender kiss is hauntingly familiar. Conlan McTeer, Duke of Adair, has come to Dublin to fight for a free Ireland. But he’s suddenly reunited with the young Englishwoman who had once claimed his heart, and his passion turns from politics to pleasure. When their sizzling encounter brings danger to Anna’s door, she must decide where her loyalties lie-and quickly. For someone will do whatever it takes to destroy Conlan . . . and anyone he dares to love. LAUREL McKEE lives in Oklahoma with a menagerie of two cats, a Pug, and a bossy miniature poodle. She loves dance classes, collecting cheesy travel souvenirs, and watching the Food Network-even though she doesn’t cook. Writing as Amanda McCabe, her books have been nominated for many awards, including the RITA Award, the Romantic Times BOOKReviews Reviewers’ Choice Award, the Booksellers Best, the National Readers Choice Award, and the Holt Medallion. Please visit her website at www.LaurelMcKee.net. Although this is the second book in a trilogy, I really think it can stand alone. I had no problem getting into the story and was enchanted right from the start. I must admit that when someone is kissed by another person who is wearing a mask, I know where this story is going. Seriously, this can only work in a historical romance. So when Anna is kissed by Conlan, you can only know that there is going to a lot of hotness to follow. The plot works on a lot of levels with a bit of mystery and thrills built in. This one will definitely keep you warm on a cold winter night. I am so looking forward to reading this one. Thanks for the info and chance to win! It looks good. Fact One: Laurel McKee is none other than an author whose books I already read, Amanda McCabe. Daily entry for December 13/10. Thank you! 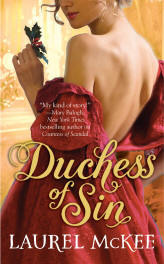 From her website, I learned that Laurel McKee is actually the pen name for regency romance writer Amanda McCabe.